Pat dry the cod fillets with paper towels and remove any stray bones. Place one filet in an oven proof dish and drizzle 1 Tbsp olive oil over it. LIGHTLY salt and pepper. Don't over-season, since the prosciutto provides plenty of salty flavor. Place the second filet on top with the thick end on top of the thin end of the lower filet. This creates an even shape. Wrap the two stacked fillets with prosciutto, overlapping slightly as you go. Add the tomatoes to the dish (even the ones that got loose from the vine). Season the fillet and tomatoes LIGHTLY with salt and pepper and drizzle with the remaining oil. Roast in the oven for 35 minutes. The fish should easily flake when pierced with a fork. 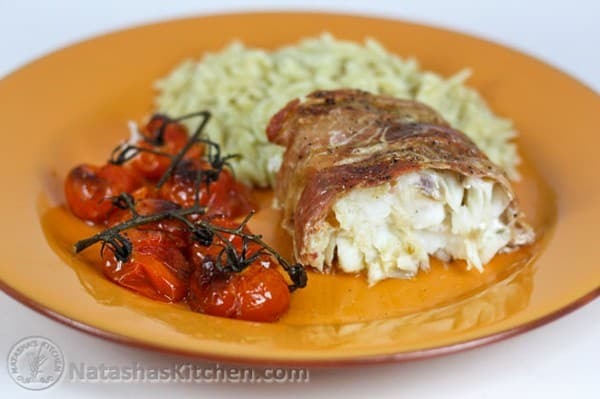 Carefully slice the cod and serve the tomatoes on the side. Generously spoon the cooking juices over the fish and enjoy! Notes: I paired this with buttered orzo (a rice-shaped pasta). It was scrumptious! I usually use frozen fish filets. Cod can get pricey depending on the season. I bought in January at $4.98/pound and that seemed high to me.